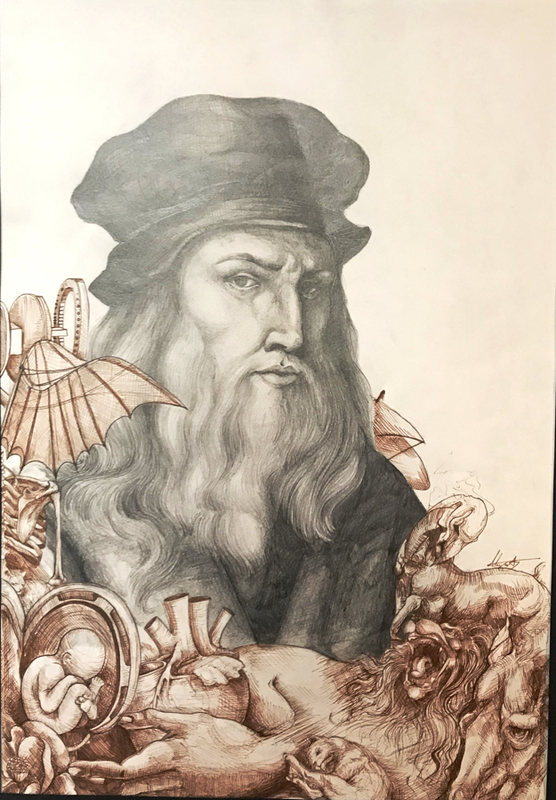 DaVinci Study, Graphite on Paper, original artwork by Alyse Stewart, 11th Grade Manteo HS. One of the best parts of life on the Outer Banks is how much support the community gives to our kids, and there is, perhaps no better example of that than the annual Dare County Schools Youth Art Exhibit at Glenn Eure’s Ghost Fleet Gallery in Nags Head. The show is exactly as the title describes it—the artwork of the children of all ten Dare County schools are placed on display—this year through January 18. There are a couple of aspects of the show that make it wonderful. First is the quality of the art the kids produce. Especially getting into the high school years, the knowledge of how to use presentation and form is remarkable. But as wonderful as the art is, the reception for the grand opening of the show is the place to be. This year it was last Sunday, January 6. Every year it is one of the best attended art openings—probably the best attended—of the year. Of course…an exact count of how many individual student artists is difficult to find, but it approaches 200 and every has parents, brothers, sisters and assorted other relatives. Attending the opening reception is a joyous occasion. It is difficult to know who is prouder of the works of art on display—the parents or the young artists. Glenn and Pat Eure, the owners of the gallery, have always made it a point to encourage the creativity of youth and artists of all stripes in the Outer Banks community. Glenn unfortunately passed away in September of last year, but this show in particular and how much it means to the kids, parents and community in general stands as the exemplary tribute to a remarkable man. The Outer Banks has so much to offer that any time is a good time to visit. Check out Joe Lamb, Jr. & Associates and make your plans to stay for week or two today.